Nelson Ireson May 20, 2015 Comment Now! Don’t worry, America, it’s not a wagon. It just drives like one, is as useful as one, and, if you squint at it the right way, kinda looks like one. But it’s still one of God’s Own Vehicles: a fully Merkuh-approved crossover. But I didn’t drive the new 2017 Audi Q7 in America—it won’t reach our streets until early next year. Instead, I spent two days driving it through the Swiss Alps, where its footprint seems rather larger than most of the other vehicles on the road. Despite that large body—which, like my own, doesn’t seem nearly so huge here in the U.S.—the Q7 hustles a switchback like a much smaller car. Almost like a hatchback. Or—gasp!—a wagon. 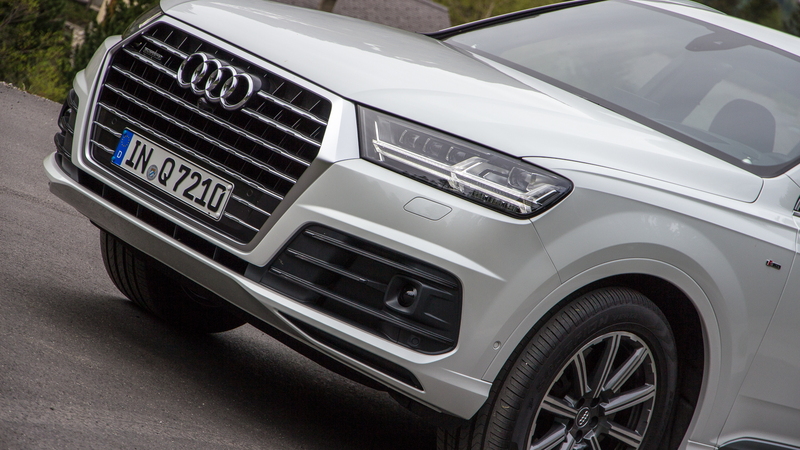 Part of that nimbleness comes from the Q7’s huge weight savings over the previous model, and the fact that it’s just outright pretty darned light for a vehicle of its type, equipment level, and size. 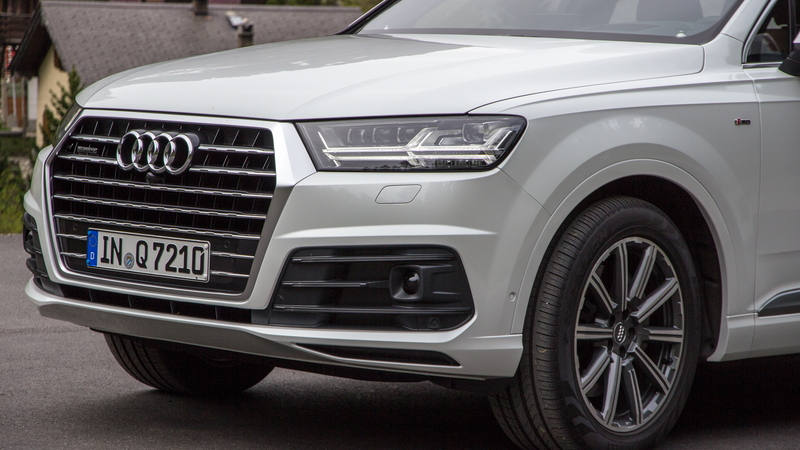 Part of the Q7’s athleticism also comes from the new four-wheel steering system, which reduces the turning radius by a bit more than 3 feet, improving lower-speed handling and increasing higher-speed stability. The American-specification versions of the 2017 Audi Q7 haven’t yet been nailed down in their particulars, meaning we don’t have precise curb weights just yet, but we can get a general idea from the European-spec cars. There are some important differences—ones that will have a direct impact on the curb weight. For instance, German-market cars are available with five seats (American Q7s will all have seven) and without the panoramic sunroof (which will be standard on American Q7s). 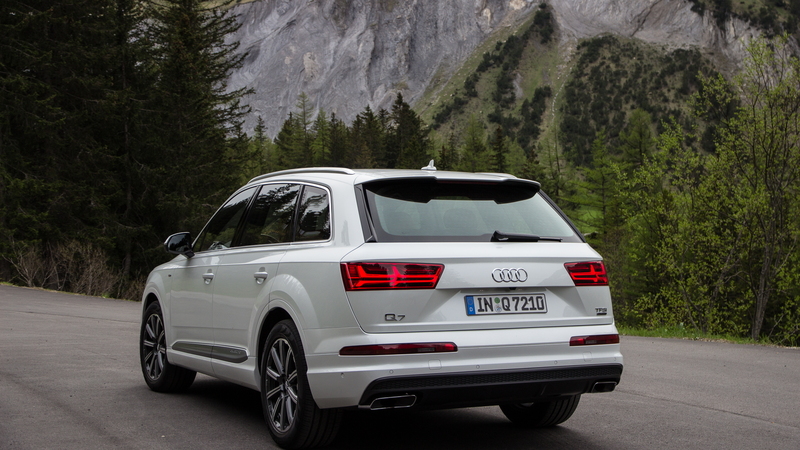 That said: the new Q7 saves several hundred pounds over the previous model, tipping the scales around 4,500 pounds. 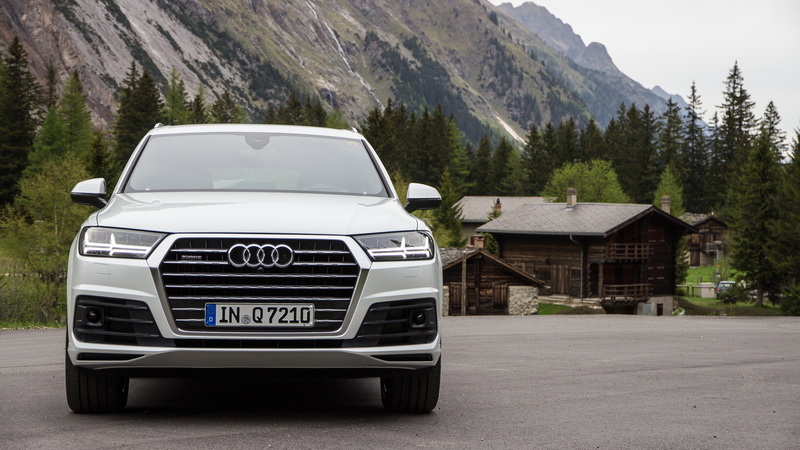 That’s not exactly light, but in the seven-passenger class, and with the Q7’s level of interior quality, cabin quietness, quattro all-wheel drive, and high-tech accoutrement, it’s a relative flyweight. All of which adds up to this: the 2017 Audi Q7 is surprisingly fun to drive, whether you pick the 3.0-liter TFSI V-6 gasoline engine or the 3.0-liter TDI V-6 diesel. The gas engine rates 333 horsepower and and 324 pound-feet of torque; diesel ratings have yet to be specified for the American market, but expect something around 260 horsepower and 440 pound-feet of torque. Either engine slings the Q7 forward with a pleasant willingness, while the new five-link suspension (front and rear) and adaptive damping lend the Q7 a truly car-like (cough *wagonlike* cough) feel behind the wheel. That steering wheel, by the way, gets electromechanical power assist, while the eight-speed automatic transmission offers normal and sport modes; all of these settings can be tuned to the driver’s desired specification through the Audi Drive Select Individual settings. But for the family with a mind toward the future—or the hyper-connected present—the Q7’s real killer app is literally its killer app: the latest generation of MMI, Audi’s Multi-Media Interface infotainment system. With a brilliantly sharp central display screen, a smart Virtual Cockpit instrument panel screen that’s just as crisp and colorful, and twin Nvidia Tegra 30 processors doing supercomputer operations on the navigation, entertainment, and other data, and LTE connectivity on the go, the 2016 Q7 is a tech-head’s dream. If you’d like to know more, we’ve covered the new MMI system and the Virtual Cockpit in detail already—so go bone up. There’s even a head-up display (HUD) that relays crisp, clear versions of the navigation and vehicle information right onto the windscreen. For the tech-heads in training, there’s also an available rear-seat entertainment option that essentially slaps a pair of tablets to the back of the front seats—it’s an elegant look and one that iPad-obsessed kids will instantly recognize. Second-row space, too, is ample, both for kids and adults. The seats recline for greater comfort, while leg room and head room are abundant even for my long-legged 6’2” frame. Cargo space behind the second row is good, and the third-row seats (only for smaller kids—there’s just no real leg room for anyone larger) are power-operated, allowing them to be raised or lowered by a button accessible from the rear hatch area. Cargo management is provided by two rails and accessories that attach to provide both a hard fence and a soft net, allowing all sorts of configurations for securing various items. I only had a day and a half with the Q7, and while it was enough to get a good feel for the crossover’s driving characteristics, materials quality, and an initial take on the technology, it’s such a richly featured vehicle that it would take at least a week to fully appreciate everything it has to offer—and I’d love to spend that week with it. 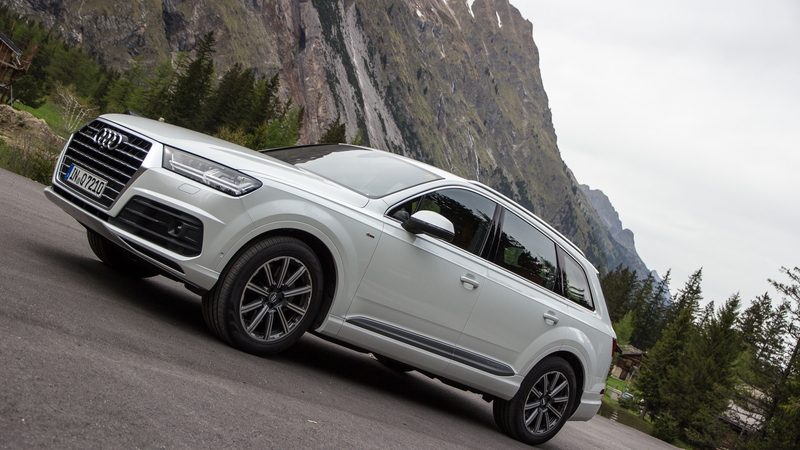 What I did come away with, however, was a surprisingly good impression of the Q7’s handling and driving enjoyment, as well as an appreciation for its flexibility, luxury, and usefulness as a family-transporting masterpiece.